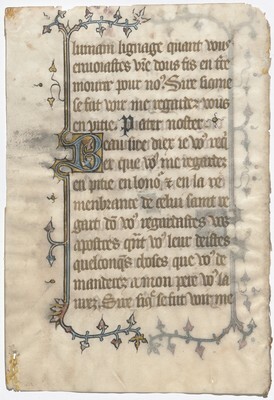 Text: Doulx dieu, doulx pere, sainte trinite. The leaf is from a Psalter dismembered by Otto F. Ege for inclusion in 42 specimen sets of medieval manuscript leaves he compiled in the 1940s under the title "Fifty Original Leaves from Medieval Manuscripts". It is listed as no. 25. The leaf came onto the market in 1981, sold by Maggs Bros, London, to the Friends of the Australian National University Library. Contents: Devotional prayer Doulx dieu, doulx pere, sainte trinite (in English, The Seven Requests to our Lord or Prayer to the Trinity), beginning partway through the initial request, continuing to the third request. Decoration: two 2-line initials in blue on gold ground with vine leaf infill and foliate extensions forming a partial frame around the text. One 1-line initial in gold, filled in pink and heightened in white painted on scalloped blue ground. One 1-line initial in black ink.